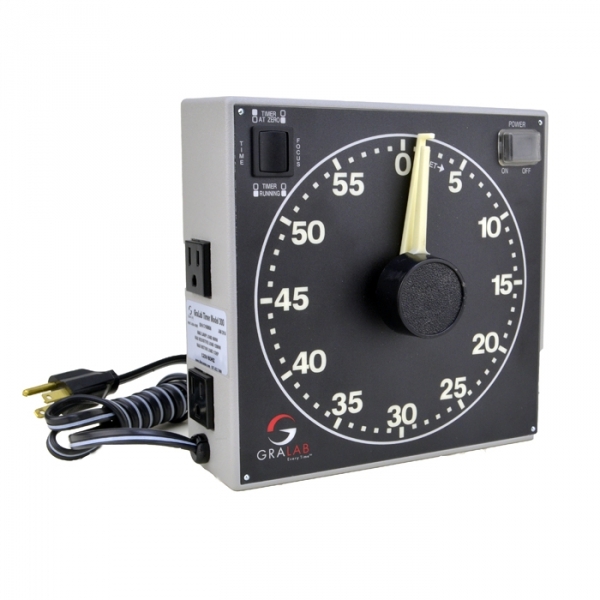 The GraLab 300 Darkroom Timer (GR300) is one of the most recognizable pieces of equipment in a photographic darkroom. Educational institutions, fine artists, and professional labs have relied on the GraLab 300 for decades. 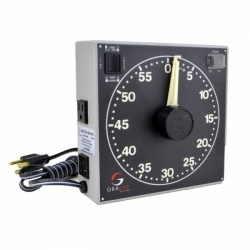 Thanks to its non-fogging, glowing paint, minutes and seconds can easily be read across the room, in total darkness - making the GraLab 300 timer ideal for film processing, especially the precise timing required by color processing. The 60-minute time range can be set in minutes and seconds and is able to control an enlarger. Its two hands for setting the time are as easy and instinctive as setting a clock. An exclusive dual-cam mechanism provides extreme accuracy for long time intervals (+/-.015% at maximum dial setting), allowing for finely timed operations in your worklow. Two separate outlet receptacles control an enlarger or printer and safelight by a combination time/focus switch. Each outlet has a 600 watts rated capacity for operating most film processing equipment. The GraLab 300 can be used with a relay for heavier loads. The case is made of durable plastic and measures 7 1/2" x 7 1/2" x 2 1/2". It is exceptionally strong, withstands high impact, resists chemicals and moisture, and is electrically non-conductive. The case has a recessed handle in the back and keyholes for wall mounting. WARNING: When a SAFELIGHT is plugged in to the SAFELIGHT OUTLET on this timer, the SAFELIGHT is OFF during both the FOCUS and TIMER modes. The SAFELIGHT only comes ON when TIME HAS EXPIRED, in TIMER mode. There is NO volume or on/off control for the buzzer, but it can be disabled (please contact Freestyle for instructions).